GLOGIRLY: Have a Shaggy Chic Christmas & Giveaway! 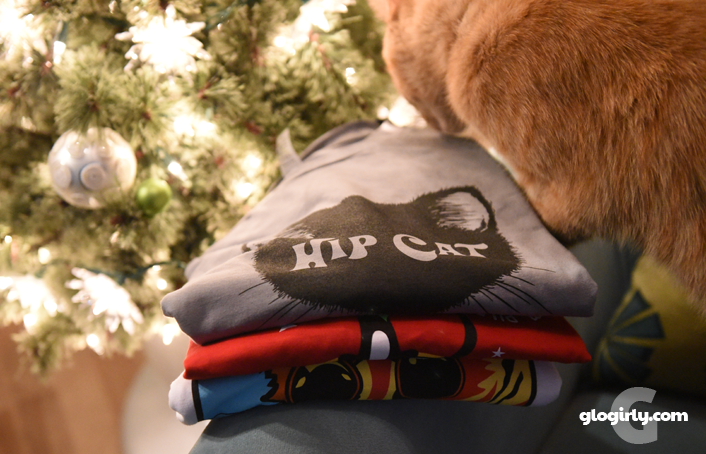 I love cat shirts! What a cool company Shaggy Chic is! Merry Christmas Katie and Waffles!! Oh and Glogirly.. * thinks * and Gloman!!!! I like the original artwork. Man I love that Waffles in those glasses! These Tees are groovy!!!! What a great business they thought up for a great cause. Let's show the world how important it is to rescue animals. Loving the tees on Gloman!! He's a cool Cat! I really love that Shaggy Chic works to help rescues and the animals they save. I have one of their shirts and just love it. I'd love an entire wardrobe of their shirts and know these would be a great way for a rescue I support to raise money for the animals. I love that it helps rescue orgs and animals. I do what I can, but it's nice to know that there are awesome companies like this that care and do so much! Cool shirts. We'll have to check that out! Cool and unique designs! I love them! OH wow, those are such cool tshirts! Awesome! I adore these cute designs on Shaggy Chic! I love the philosophy and mission of this company! Paws up to them! That is such a great idea! There are a lot of rescue organizations that barely survive and don't have the resources to do more than care for the animals! I can't pick only one thing I love about Shaggy Chic. I love the designs, the philosophy and mission, that the shirts are made to last,...there's so much that's fabulous. 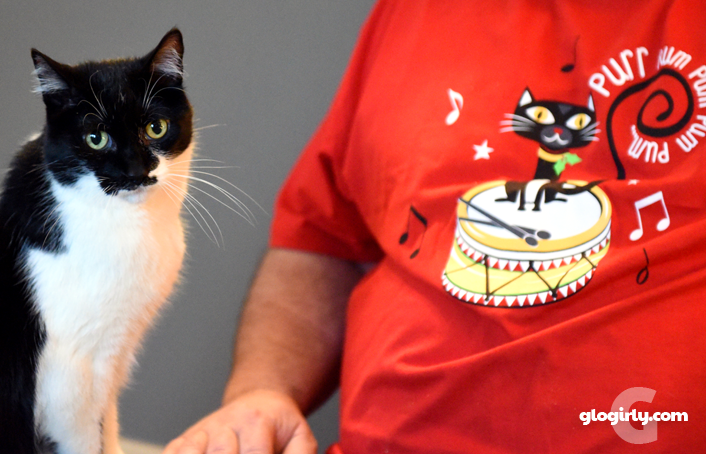 I know some volunteers at our local humane society who could use a new shirt. 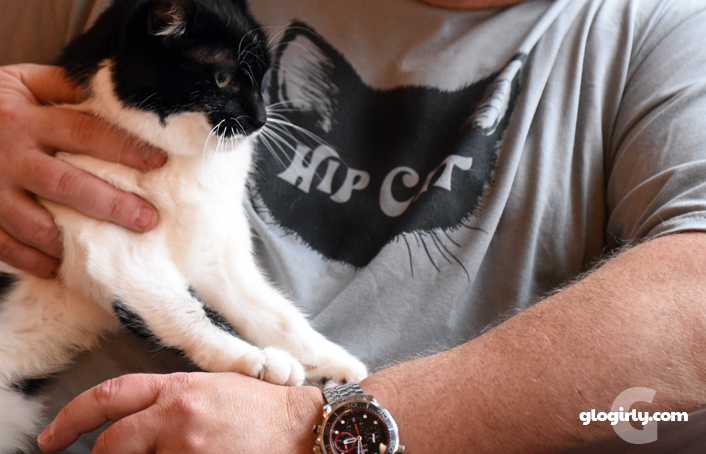 Ours are full of holes from some energetic kitty hugs! I'm glad to hear the shirts are roomy! As part of my pain condition, anything that touches my skin can *hurt* so I have to be pretty picky and find soft things to wear. These shirts sounds like they'd pass that test! :) This is a really pawesome giveaway. We love that they support rescues! And those are some cool shirts too. ok - first mom loves a good t-shirt as well and these look great. and we LOVE when companies give back... what a great thing to do for rescues!!! OMC! These look too cute!! We LOVE LOVE the fact they help rescues, but we like the vibrant colors too. OMC! Our mom lives in tshirts! She would love some of these. Those shirts are so darn cool and everyone should have at least one! Really cool shirts and giveaway. I like that they are supporters of various rescues and other animal-realated nonprofits. 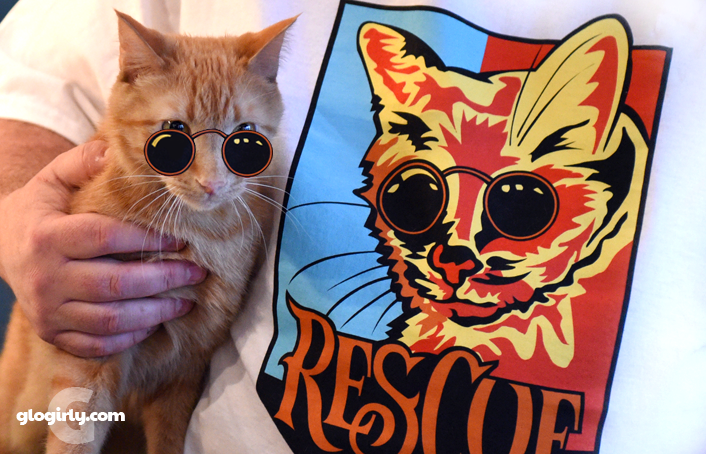 The fact that the shirts help to encourage the idea of reusing cats is the very best part about Shaggy Chic t-shirts! What a cool giveaway! I hope my shelter can win. What a great giveaway! We love the shirts and the cause. Those are some neat designs and the colors are bright. wow - love the graphics! What a truly generous giveaway. I love their philosophy and would really like my favorite shelter to win this one! What a generous giveaway! So happy to have a chance to win. Good luck everyone! I love that they want to save animals! This is an awesome contest! 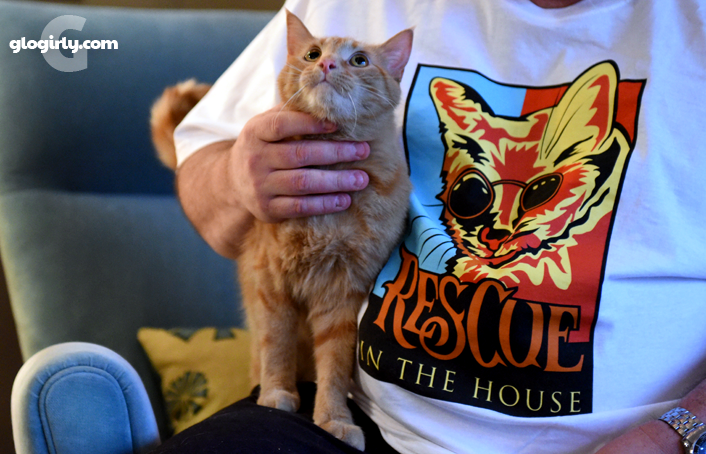 I would love for my favorite shelter to get these shirts! I like that a portion of all sales benefit rescue groups. It's great to find a group so dedicated to helping rescues. 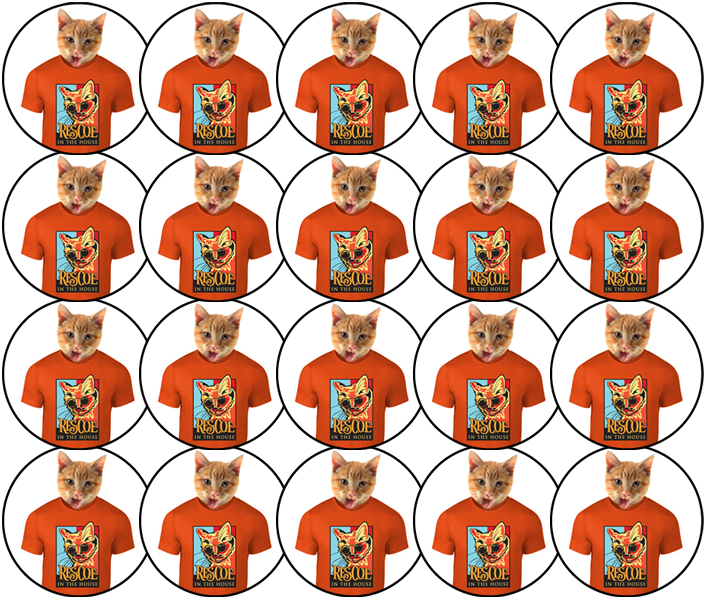 What cool cat shirts! Are you suuuuure that isn't Waffles on that shirt, because it sure looks like him to us. We rescue cats are the best kind of cats! We are both rescues, twice even! Love those t shirts! That’s what I like best. 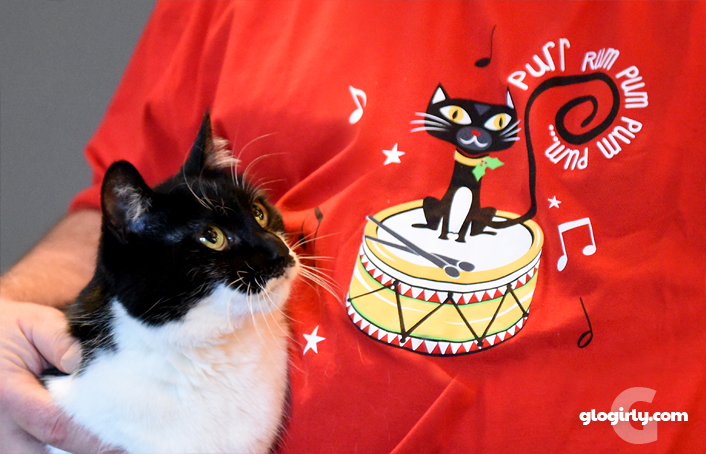 We think purrr-rum-pa-pum-pum is TOO cute!! Super fun post and give-away! I love Waffle's T because it reminds me of John Lennon. I like quirky and these shirts are quirky! Love the bright colorsand the kitty shades! The fact that it promotes rescue and adoption. We love the Idea of promoting rescue and adoption. And we'd love our favorite rescue place to get some t-shirts they can sell or even give away as presents to new adopters! You know it's Feline Rescue of St. Paul! That's sort of my alma mater, Mommy says. What ever is a alma mater? A rescue place? Weird, mom. Just say the place I found you! How generous!..Love the bright colors! Well, I love animals AND I do volunteer for a rescue group, so I think this is an awesome website. I love all of the shirts! It would be hard to decide which ones to get. I love that they are willing to offer 20 tshirts to a rescue! It is wonderful when companies help animal rescues. And I LOVE the shirts! Ordered a few of these shirts and just love them. They also deliver fast. Wow what a great company and what fantastic shirts! Congratulations on the new business! All the best to Amy and Kathy on this new adventure! I like that they help rescue groups raise money through fundraisers. I like that a portion of their sales benefit rescue groups. I love the mission of Shaggy Chic shirts and their wonderful products with beautiful, unique artwork. Really Cool Shirts! They have some really cool stuff!